My Royal Enfield Bullet and a very tall version of me. It's nice to have a hobby that tells friends and loved ones what you want/need as gifts. My Royal Enfield Bullet motorcycle does the trick for me. This Christmas, my daughter Erin contracted with Sheri at Paper Bird Graphics in Tulsa, Okla. to do a portrait of my Royal Enfield and me. 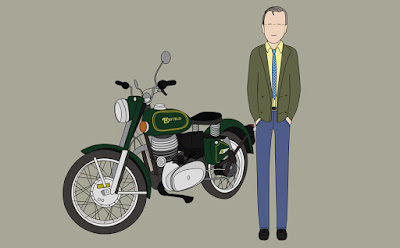 The finished artwork is very true to life — as regards the motorcycle. Sheri included the pilot light visible in the nacelle — it's the distinctive face of the Bullet. I'm not as thin as shown. And, while my hair is gray, as seen here, there isn't nearly that much of it left. That's just Sheri's style. I don't mind. I'll be working her illustration into upcoming blog items, I am sure. For one thing, it's very easy to add a background. 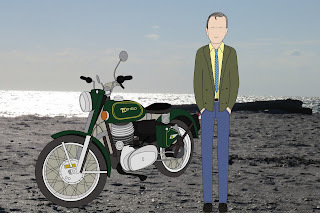 Your cartoon correspondent and his Royal Enfield may be reporting soon from the far corners of the world. We'll start our journey here in Florida. It was a beautiful day at the beach. My Bullet and me on the beach in Florida. What a bad daughter!!!!!! If she really loved her dad she'd ante up for a new 5-speed gearbox on dad's Bullet. If one of my boys did that, they'd be cut out of the will immediately......yeah. right. She probably realizes that I secretly enjoy torturing myself with the four-speed.